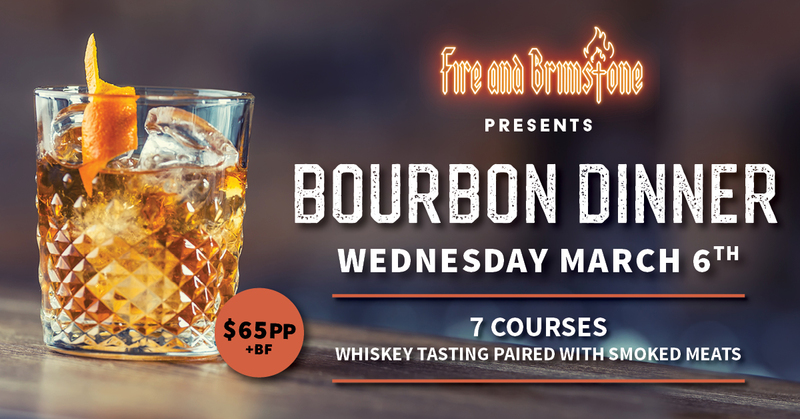 Join us at Fire and Brimstone BBQ on Wednesday March 6th for a 7 course Bourbon Tasting Dinner paired with low n slow smoked barbeque meats! You will be taken on a journey with a Bourbon Pro, Matt from Dramnation and learn the history and behind the scenes of the large range of bourbons. Our Pitmaster at Fire and Brimstone BBQ - Brad Shorten - will be working closely with Matt to pair a variety of his smoked meats with each bourbon. Event begins at 7pm - Tickets are $65pp - Spaces are limited - don't miss out! We welcome anyone aged from 18 and up!